ValleyWorks Career Center is preparing for the next local job fair, scheduled for February 2016. If you are an employer with interest in participating or if you have any questions regarding this Job Fair, you may register with LouAnne Cloyd, Business Services Representative at at 978.241.4737 or lcloyd@detma.org. 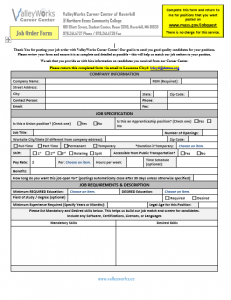 Businesses with openings for consideration may submit a job order form to post any positions. All job postings are uploaded to www.mass.gov/jobquest, and there is no cost to the Employer. The staff at ValleyWorks Career Center will make every attempt to connect quality job seekers to your openings.